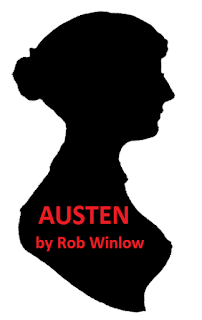 Last week, I ventured all the way out to Doncaster on a wet and grey evening to join the audience for Austen, a musical written by Rob Winlow. As a fan of all things long 18th century and a lover of musical theatre, I was intrigued to see this new show that made such a splash at the Edinburgh Fringe and Jane Austen Festival last year. It cannot be easy to approach such a well known story in a fresh way, nor to avoid the pitfalls of falling into fiction or dramatised history lesson, but this delightful show experiences no such problems. Directed by Matt Aston and with a cast of just four, Austen is an absorbing, celebratory and ultimately moving show that touches on the major points of the author's life and story. It examines the relationship between Jane and her parents and those closest to her as she struggles to see her work reach a wider audience. Taking as its central theme Jane's adventures in society and the men who may have won her heart, the show, happily, does not focus only on the matter of romance. It addresses the challenges that faced a woman who had ambitions beyond marriage and longed to be recognised for their intellectual ability as well as their ability to catch a good husband. It is always a delight to hear a score in which the music is a match for the period and Austen achieves this admirably; its songs are melodic, nuanced and, crucially, memorable. In the safe hands of Musical Director Edward Winlow, one is swept up in the show from the off. The small cast perform a variety of roles and the singing from all is a joy to hear. As Jane, Annie Kirkman gives a marvellously assured performance and she is more than matched by her fellow cast members, man of many voices Joshua Meredith, Kate Steel, who portrays both mother and friend perfectly and Oliver Brookes, who captures a wonderful sense of playful gravity as Jane's father. Do catch Austen if you get the opportunity, whether you are a fan of theatre or Jane, you won't regret it! Thanks for the review, Catherine. Sounds like a gem. I hope it does cross the Atlantic one day!